Dr. Ella Faktorovich founded the Pacific Vision Institute with the vision of advancing vision corrective surgery and techniques for patients. She oversees the development and practice of innovative refractive options. 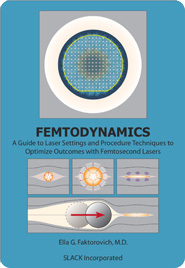 This is a textbook written by Dr. Ella Faktorovich which provides practical approaches to vision surgery techniques.